PASSION NEVER DIES! FEAR JUST GETS IN THE WAY! I for one HATE feeling FEARFUL! Fear for me would be failure, or worse wasting my time, my life, my years on something that fails. I find it amazing that no mater how fearful I get, the fear never kills my passion, my drive, my love for something, it just makes me hesitant, afraid to pursue, and afraid to be brave or courageous enough to see it through. What if we ignore fear? What if we tell those heavy fear frightening feelings to take a hike? What if everyone actually lived up to their own potential? I can’t help today but to think about a life lived without fear! How would we live each day differently? When I am left with a huge obstacle standing in my way I go to the scriptures of the Bible to find the answers. When you search fear over and over you will read…”fear not”, “do not be afraid”, “I am with you”, “I will not leave you, nor forsake you”, “Peace I give you”, “be strong”, “be courageous”, “trust me”. I find it fascinating that God is asking us to not be afraid. It has to be a very conscious effort on our own part to not allow fear to over take us. Sure we can pray and ask God to help us to not be afraid, and of course he will, but we must first take the first step out in faith trusting in him that he will always have our back, and not shrink back and become paralyzed in our own fear. 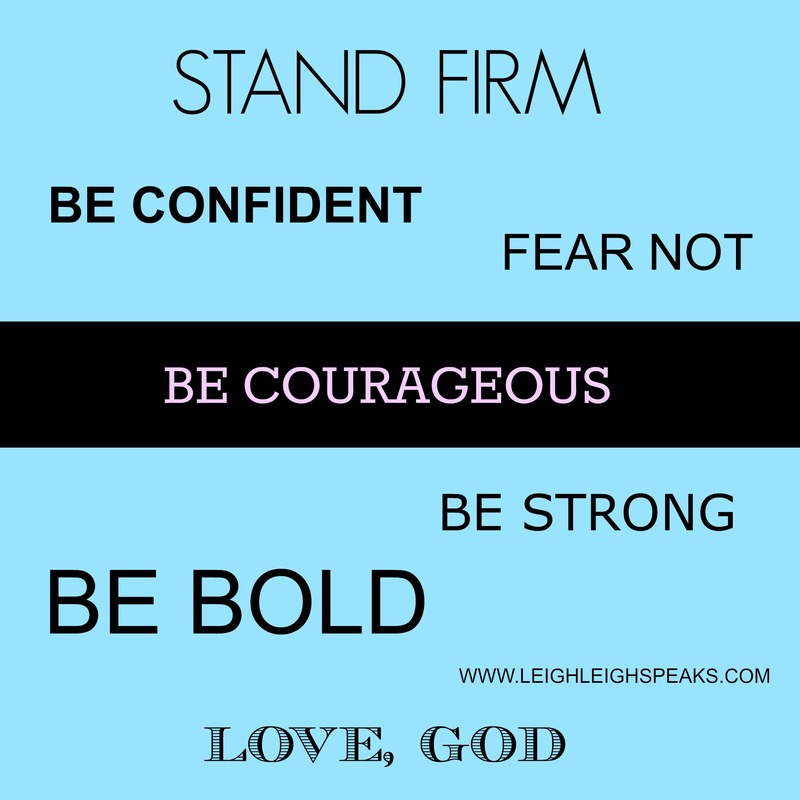 So let’s go forward and even if we are still feeling afraid, be bold enough and brave enough to do what ever it is that scares the day lights out of us, knowing God is with us every step of the way helping us push through that fear! Be sure to follow my blog via email subscription (scroll all the way down), or like me on FACEBOOK HERE or TWITTER HERE!